GROW WITH US…and join us to be part of THE ANGELS DIFFERENCE. • Do you want to serve and provide Legendary Care to seniors? • Do you want to develop impactful personal connections to make a difference in lives? • Do you want to help create memorable experiences that enrich seniors’ lives? • Do you want to be a vital part of a nurturing environment? • Do want to work for a company that values and serves every senior, in every season of life? • Do you want to be part of a growing company with future professional opportunities for top performers? Our employees say they enjoy and appreciate the opportunity to interact with executive leadership on a regular basis – which is virtually unheard of in the industry. We often hear that they feel that they are making a real difference and are appreciated for their efforts. "Angels Senior Living at New Tampa has always been a special place for me. I started as a volunteer in college and have remained with the community serving in many different capacities. I have had the privilege of meeting and interacting with so many amazing people from the residents, staff, and families that have entered the doors at some point over the past twenty-five years. It brings me such joy to help others....I could not imagine working anywhere else!" "Angels has given me the opportunity to pursue my passion of working with older adults. From my initial interview to my current position, I have felt appreciated and respected by all the staff. The Lodges is one big family... staff, residents, and home health working together. Our Executive Director is an amazing leader." "Working at Angels has allowed me to use my creativity to provide 5-star meals to the residents. The teamwork between all co-workers is top notch." "I love the people that live here in our community and the interaction between them, one-on-one. I love the staff that I work with." 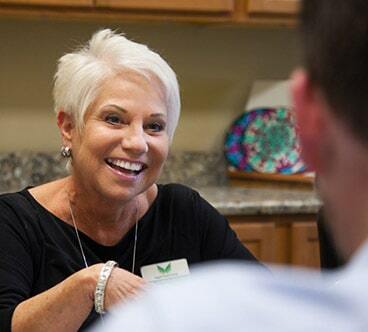 One of our core beliefs is that YOU are the greatest asset we have – our talent who performs above and beyond with passion for what they do is what has made Angels Senior Living what it is today and WILL continue to define our future. We are only as good as our staff! 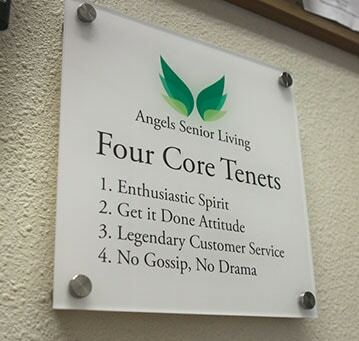 All Angels’ employees follow The Four Core Tenets. It’s not just fluff, it’s real and we live by it daily. Angels employees are accountable and demonstrate these daily in their role within the organization. Promoting within our company is commonplace at Angels as we’re dedicated to making sure you thrive and encourage you to work towards your career development goals. What are you waiting for? We’re EXCITED to meet you. Subscribe to the Angels Senior Living newsletter and we will inform you about our latest news and services.